"We're going to do our best to try and move you tonight. If you like the blues, I think we can." B.B. King has been a huge influence on me from the first time I heard, Live at the Regal when I was fifteen years old. Many people think of that album as B.B.’s best work. However, I believe Blues is King is his definitive live recording. Live at the Regal of course is an absolutely stunning piece of art. It pretty much laid down the template for what fans could expect from a B.B. 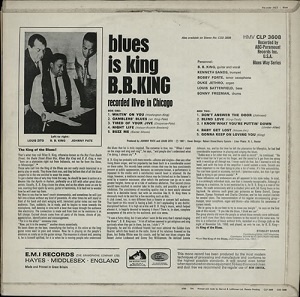 King live performance or any subsequent live album to be released except Blues Is King. It’s all there at the Regal; Opening with Everyday I Have the Blues, Sweet Little Angel, You Upset Me Baby, Help The Poor and of course the greatest crowd pleaser of all time How Blue Can You Get. King, with his big band, tears through the set list at break neck speed, with a joyous countenance and the characteristic chitlin’ circuit uptempo horn arrangements. It was recorded on November 21, 1964, at a time when the implications of Beatlemania and its negative impact on black musical expression had not been fully realized. Just two weeks shy of two years later, in the same windy city things weren’t so joyous. B.B. King blew into town with hellhounds on his trail. Well, it was the IRS actually and invaders from Great Britain who changed the complexion of rhythm & blues. Motown Records was in full swing with their pop friendly spin on black music. James Brown had a brand new bag and felt good about it. Where this left a forty year old, flat footed blues singer, fronting a big band at the dawning of the Age of Aquarius was anybody’s guess. For starters a big band wasn’t an option. Neither was a theatre, regal or otherwise. It was a small combo in a smaller venue, a nightclub. real. The sound engineer managed to capture the essence of B.B. King. The live mics (sometimes 2 taped together) also captured the power and response coming from the audience. The blues isn’t always pretty, but it is real and that is the beauty of B.B. King. He is REAL! 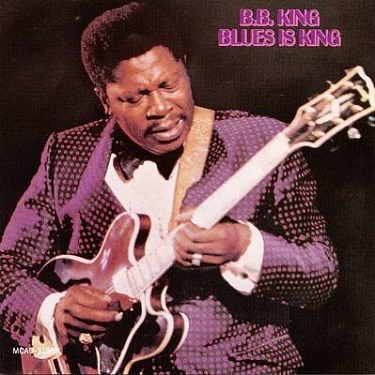 Blues is King captures this better than any of his numerous live recordings. B.B. King's playing and singing is full of emotion. He feels every note, every vibrato thrill and every bend of a string. He makes the faces which go with that inner feeling. B.B. King was a supreme and accomplished soloist who went beyond the typical blues styles. He learned his single-string style of guitar playing by endlessly listening to T-Bone Walker and Lonnie Johnson 78's. He admits that he did lock himself up with the record player picking off licks. He goes back to T-Bone for those riffs around the chords positions and Johnson for his call and response between the voice and guitar. Forget about the official line that he was influenced by Charlie Christian’s guitar. There isn't a hint of Christian chords, scales or modes in his playing. 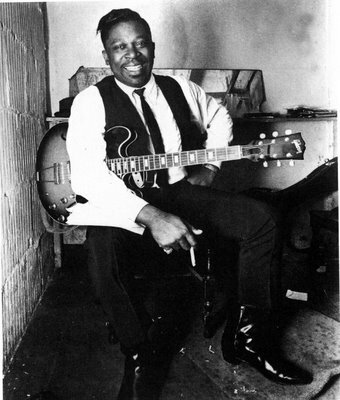 Each of his improvised solos on Blues Is King had an internal logic and build-up of their own. Like T-Bone, he relied heavily on variations of the notes of the chord (the work space) to create distinct musical phrases which he linked together in a musical grammar that was his own. His technical virtuosity is really impressive on this set. Natural and original finger vibrato and note bending techniques, plus the full and rich tone of his guitar are all unique features of B.B. 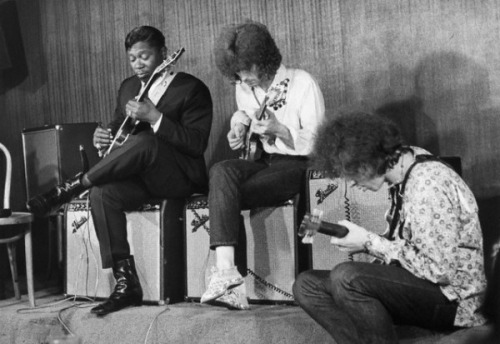 King's style, combined with his ability to conceive a whole solo piece that actually says something, instead of a flurry of blinding fast notes typical of virtually all white guitarists of that period. All his solos are based on broken short lines of licks that have a kind of stammering, stopping and building tension. Each phrase is separated by pauses and space. His slow blues playing typically establishes the mood by the exquisite opening phrases which have plenty of breathing space between them. B.B. always played behind the beat instead of the usual metronomic on-the-beat playing. The solos have clarity and plenty of breathing space and he changed register only when it made sense in the design of the actual piece. Although he always focused on the top note of the chord, he is known to hit the lower strings in a trademarked tension building. Although this is a T-Bone Walker derived technique, B.B. had, by 1966, established himself as the greatest of the singer-guitarists who blend vocals with guitar. His playing was exactly the same as his singing, full of tension and hesitations, getting in there behind the beat and stretching time. I believe this unique aspect is due to the fact that B.B. suffered from stammering as a child and to overcome this he learned to speak slowly with extra pausing and waiting to get what he wanted to say all out. All his playing sounds exactly the way he talks, with slow deliberate beginning and ends in a wave of staccato notes and then he lets it all out by his embellishments on the 12 bar verse, as if he finally succeeded in what he wanted to say. 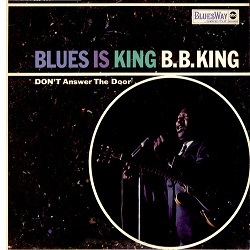 On Blues is King, B.B. is clearly not restrained by the big band sound and ventures away from the guitar call and response with the horn section to which he was so accustomed. Here tenor sax man Bobby Forte and trumpeter Kenneth Sands were looking for holes, nooks and crannies to fill with their bandstand head arrangements. Duke Jethro plays the Hammond B3 throughout the proceedings and that instrument is higher in the mix than on other King live recordings. In the album’s liner notes, Louis Satterfield is credited with playing bass. He wasn’t present on the bandstand that evening, but his bass is overdubbed on a few tunes after the fact. The album opens with a B.B. King original Waiting on You. This is where Peter Green clearly stole his sound and all the licks. Forget about the accidentally reversed pickups on his Les Paul. He wanted that sound that B.B. was dishing out and his tech put the pickups out of phase for him. They didn't know about the 355 varitone switch and it was a deliberate attempt to copy B.B. 's ES-355 sounds. Gambler's Blues kicks in with an intense guitar intro and immediately the ladies go wild with feel. This intro is pure heaven drenched with deliberate spring reverb from what sounds like a Fender Twin Amp. Night Life is the great Willie Nelson tune that B.B. turns into pure rhythm & blues gold. Again, it is drenched in amp reverb which gave it that soulful sound which B.B. wanted to present to the all black audience who was developing an ear toward 60’s era soul which was on the rise while blues was in decline. Tired of Your Jive is a great shuffle where Hammond B3 player Jethro plays the bass pedals. This number shows a great use of the varitone settings. Although later in life B.B. claims that he didn't know what it was for and never used it. This is just one of his white lies he liked to float out there during interviews. He knew exactly which sound to use for each song. On Buzz Me Jethro excels with horn section style chords and the B3 bass pedals. His great Hammond playing with amp feedback is everywhere because B.B. played at high volumes. On Don’t Answer the Door King eshews the guitar intro of the original and jumps right into the lyric, “Baby I don’t want a soul...” he pauses and lets the audience erupt in shouts and screams before finishing the line, “hangin’ around my house when I’m not at home.” It is clear that King is performing to a black audience as they participate by responding to every line. ‘Amens’ and ‘You got that right,’ as if they were in a sanctified Baptist Church. The gospel influence in rhythm & blues can’t be overstated and it is clear that this influence runs directly through the King of the Blues and his fans. Blind Love begins with B.B. saying, "If you've been with us for a long time, you might remember this one". He breaks a string at 2:16 just when he is riding high with an incredible lyrical solo. He gives out a quick “Ahhh” and continues playing on the remaining five strings. He realized that his playing is entirely dependent on the high E string he just lost to a super powerful bend and he wisely decides to end the tune on a verse even foregoing the characteristic end runs on the guitar. Ahhh! This is blues. I Know What You’re Puttin’ Down features the best guitar intro ever. 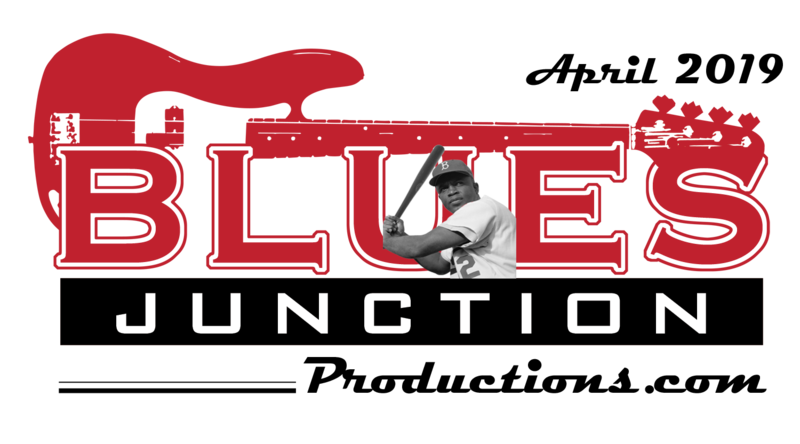 This is a slowed down version of a Louis Jordan jump tune. B.B. clearly had a great affection for Jordan’s music. He was clearly a big influence on King. Here his singing is impassioned, screaming and begging. The women were digging it. The band played freely, picking up head arrangements from each other. Baby Get Lost really features B.B.’s vocals with Bobby Forte sneaking in and placing nice tenor fills here and there. He sounds eager to solo but B.B. nudges him out with a short solo of his own. It may be interesting to note that B.B. did not give out long solos to anyone on this set. He chose to do his thing. He was feeling good and wasn’t in the mood to share the spotlight with the band to the degree he did throughout his career. This is just another aspect of Blues Is King that separates it from the rest of his live body of recordings. Gonna Keep On Loving You is another B.B. King original. B.B. keeps messing with his tuning pegs or it sounds like the E string slipped off the saddles after a harsh bend and he stops two or three bars in the middle of his solo to pull it back on. He does this twice. Some folks misconstrued this as B.B. having a lapse in concentration or forgetting what to play. If you play these Gibson semi-hollow bodies, you'll know the string saddles are a weak point. They just weren't designed for B.B. King's three note bends. 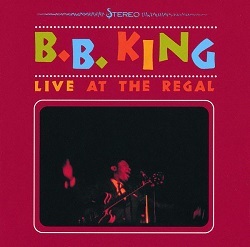 As far as the legacy of Blues is King is concerned it probably suffers unfairly by being compared to the earlier more successful Live at the Regal. The choice of final ten tunes was more or less sloppily thrown together from what was probably a two or three set gig. But make no mistake, B.B. and his small band are on fire. of the album’s cover is reversed. It is not known if this picture was even taken during the performance that was recorded for Blues is King. The liner notes by contributing editor to Jazz Magazine and a contributor to Down Beat and The Saturday Review, Stanley Dance, speaks in generalities about King’s music. In fact it reads like three separate articles stitched together from his archived writings. We learn that King is a student pilot and that “He admires such jazz greats as Kenny Burrell, George Benson, Django Reinhardt and Charlie Christian.” Aside from Dance mentioning that this record is from “a Chicago club on November 5th, 1966”, very little is revealed about the specific performances by King and his band that evening. “Live at the International Club.” King in interviews has insisted that it took place at the Burning Spear Club. Maybe the mystery surrounding this recording represents an allure unto itself. It is clear that B.B. works especially hard on this one, both in terms of his vocals and his guitar playing. The album is rough in spots and it is also unpredictable. No REAL blues man plays in a predictable manner and in a clinical style like Joe Bonamassa for instance. B.B. King helped to invent this language, he certainly added to the development of the idiom. He had the right to explore the spontaneous side of his creative nature and make mistakes on stage. That's part of the thrill of listening to a player of this caliber perform live. He refused to rest on his laurels. B.B. King pushed himself fearlessly as evidenced on Blues Is King. After almost 50 years, I still get a chill when I listen to this hair-raising recording. I still get a chill when B.B. says in his now familiar, unmistakable Mississippi accent. "We're going to do our best to try and move you tonight. If you like the blues, I think we can." You better believe he can. He did and I am moved every single time I hear Blues is King.